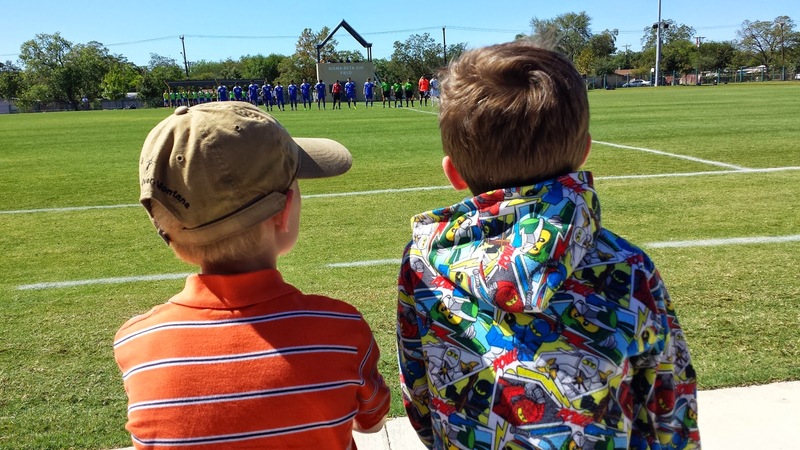 This is Zane and D, watching my nephew Tristan play soccer against St. Mary's University a couple of months ago. D. is two days older than Zane, and they play on the same soccer team. They've played on the same soccer team since they were three years old, and may continue to play together for years to come. I didn't get to spend years and years growing up with other kids, because of the Army. I don't harbor a grudge against Uncle Sam, but I don't really have a frame of reference on this aspect of my son's development. Part of me likes the idea of my son growing up with the same circle of friends. I like the idea that he will build strong ties with other kids and will have that support system over the years. I think that he will feel more secure and confident, because he will feel more comfortable. I picture him playing soccer with D right up until high school graduation. That's kind of cool, because I've never experienced that. On the other hand, I worry about stagnation. Zane will grow up with the same exact group of students in his school each year until 8th grade, at least. The same kids, the same personalities--the sameness bothers me. One boy is already on Zane's "unfriend" list, and they're only in first grade. Eighth grade will probably result in outright fisticuffs. I don't necessarily see my son's learning and growth ultimately enriched by such sameness, although he does need to learn to get along with everyone, whether he likes them or not. But I'm certainly no expert, since I did not have to deal with this situation. Sometimes I wonder if things would be different, and if Zane would be better off in a public school. Diversity breeds open mindedness and adaptability. I truly believe that my exposure to many different kinds of people and personalities over my school years prepared me better for life as an adult. I became more proficient at meeting people, even though I am extremely shy. I am more adaptable today because of our constant moving around. I didn't have be everyone's best friend. I learned to stand up for myself. I learned a great deal about people, and I learned more about myself. I think that I am more comfortable in my own skin as a result of my experiences. I am also more tolerant of the diversity of others, and accepting of different cultures, personalities, and lifestyles. I want that for my son. I look to the future, and diversity will be everywhere. People who aren't able to adapt to change will not be successful, period. I'd like to think that Zane will adapt, that he will be flexible and learn to get along with the times in which he lives. But will he? I can't say for sure. How do you teach that? Any ideas would be appreciated.